I cannot even begin to imagine how terrifying it must be for the residents of Far North Queensland right now... I can't tear myself away from the TV coverage. 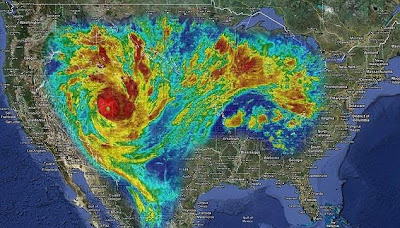 Just to give those of you not in Australia an idea of just how large Cyclone Yasi is, here's a satellite image of the cyclone superimposed over a map of the USA. That's to scale people. TO SCALE. Mother Nature sure is unleashing her fury on the poor people of Queensland right now. Sending love, prayers and positive thoughts their way. Wow! Taking into account the USA is larger than Australia, someone should superimpose that onto Australia, cos it would cover the whole of Australia. You sure that is to scale, right?